Students voted earlier this month and selected six blended burgers as the most delicious-looking of the year. Among them: a take on chicken tikka masala, a burger made of ground reindeer and another blended with beef brisket. The six earned the most votes in the James Beard Foundation’s 2017 Blended Burger Project (BBP) Campus Edition competition, part of the foundation’s Impact Programs, a movement to make burgers “more delicious, nutritious and sustainable.” For the purpose of the competition, the patty needed to include at least 25% fresh and chopped cultivated mushrooms. The chicken tikka masala burger (blended with button mushrooms) included eggplant raita, cilantro and red onion with a side of onion pakoras with tomato chutney. The entry, created by Robert Bankert, a chef at the University of Massachusetts at Amherst, was one of two winning burgers in the category for campuses with an enrollment of more than 15,000. The other, a smoked cremini and button mushroom burger on a brioche bun with a garnish of pickled root vegetables, was submitted by chef Eric Lewin of North Carolina State University in Raleigh, N.C.
A button mushroom blended burger with white cheddar schmear and smoked tomato jam with a side of roasted king oyster mushrooms, green chickpeas and radish micros from chef Christopher Patrick Browne with the University of Montana at Missoula. A reindeer and cremini mushroom burger with feta cheese croutons, cranberry ketchup on a homemade sweet potato bun with sides of kale Caesar salad and a mini blueberry milkshake from chef Jon Buchholtz with the University of Alaska at Fairbanks. A blended burger made of shiitake and cremini mushrooms, ground lamb and ground beef with apple maple bourbon BBQ sauce, smoked gouda and fried onions from chef Randy Heberlig Jr. with Dickinson College in Carlisle, Pa.
A whole beef brisket burger with grilled portabello and roasted cremini mushrooms on a black sesame seed-studded brioche bun with smoked sun-dried tomato, cherry chutney, smoked gouda, pickled tangy red onions, and honey garlic-seasoned sweet potato straws from chef Benjamin Sauer with St. Norbert College in De Pere, Wis.
Students from campuses around the country were encouraged to vote via a poll on the Beard Foundation’s website, and participants were encouraged to spread the word about the contest and their entry on social media with the #BlendedBurgerProject hashtag. 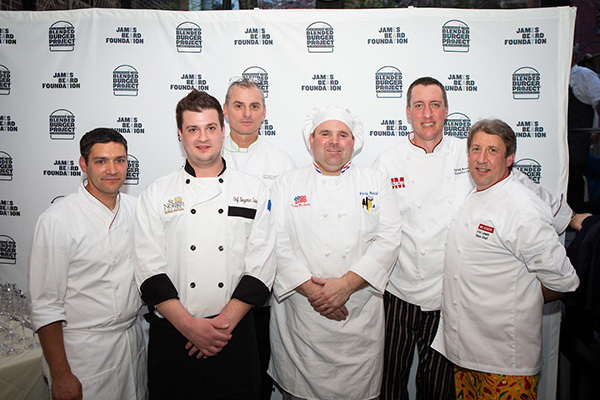 The winners of this year’s contest were featured at an April 17 event at the James Beard House and have won the chance to cook at the historic locale in 2018. “Colleges and universities were among the first to adopt ‘the blend’ to build more sustainable menus and satisfy their students,” the James Beard Foundation said in a statement. 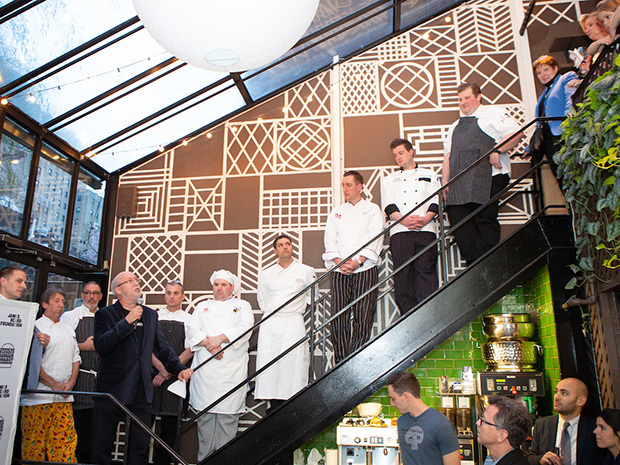 A similar competition for commercial restaurant chefs concluded at the end of January. Those winning burgers included entries from chefs at Bareburger, Cedar’s Cafe, Houston Yacht Club, Bistro at Topsail and Vintage Kitchen.